Detoxification is all about cleansing the body. It's a natural process of eliminating toxins through the colon and liver. Detoxification of the body is absolutely important to keep the digestive system efficient and the body healthy & disease free. So, this process of internal cleansing or detoxification of body is vital for a healthy life. But to keep this natural cleansing process going perfectly we need to have a good detox diet. Excess toxins in the body are very harmful as it can lead to various health problems and diseases. Pollution, pesticides, smoking, alcohol and other harmful agents that we consume from our foods or take from environment destroy the balance of our digestive system and impact negatively on overall health. According to the experts, toxic overload contributes to serious health problems including neurological disorders, inflammatory diseases and autoimmune diseases. Therefore, it is important to have a good detox diet which will boost the internal cleansing process and help body to function properly. So, what are the best foods for detox or what is the best detox diet? But before that find out the symptoms indicate that you need to detox your body and also know what a good detox diet can do for you. Excess toxins in the body are responsible for many health problems such as digestive problems, constipation, lack of weight loss, bad breath, skin problems, joint pain, headaches and fatigue. Best detox foods and good detox diet can protect body from toxins and enhance body’s overall functions. Detoxification of the body improves skin health and minimizes anti-aging effects, cleans the eye, promotes weight loss, helps in digestion and increases the productivity. Detoxification of the body or cleansing of the body is essential for liver, kidney and blood purification. So make sure you eat foods that detox your body and make you healthier. There are many foods that can help you to detoxify your body. To detox your body you need foods rich especially in antioxidants and fiber. Given below is a list of best foods for detox which are rich in natural cleansing properties. You should include them in your diet plan to get rid of extra toxins of the body. Apple: Apple is rich in fiber, folate, Vitamin A and Vitamin C. Also, provides calcium, iron, potassium and phosphorous. Apple is one of the best foods for detox. Conventional nutrients and flavonoids in apple help you to detoxify the body. Apple detox diet is very famous and it is considered very effective as well. Lemon: Lemon and lemon water play crucial role in cleansing the toxins of the body. Lemon helps to produce the bile necessary to properly digest food. Drinking lemon water in the morning on empty stomach boosts the detoxification process of your body. Beetroots: Beetroot is another very effective food for detox. It contains important phytochemicals and other nutrients which are essential for cleansing blood and liver. In addition, beetroot fights infections and maintains good acid-alkaline balance (pH) which is necessary for detoxification. Garlic: Garlic is undoubtedly one of the best foods for detox. The high sulfur content in garlic helps tremendously in the detoxification process. Also, garlic contains anti-bacteria, anti-viral and anti- septic properties, which are very helpful to clear out toxins from the body. Ginger: Just like garlic, ginger is a very effective detox food. This herb helps to get rid of free radicals and protects body from harmful agents. Ginger tea is a wonderful herbal drink that can help you to get rid of toxins and chemicals. Green Tea: Anti-oxidant properties and catechins in green tea improve the liver function and remove waste from the body. Other herbal teas which are part of best detox diet are including cardamom tea, dandelion tea, rosemary tea and peppermint tea. Green Leafy Vegetables: Dark green leafy vegetables kale, spinach, turnip greens, mustard greens and collards are strong sources of antioxidant properties. They help to alkalize the blood and strengthen the digestive tract. These vegetables are very important for the detoxification of the body. Fiber and Vitamin C Fruits: Fruits rich in fiber and Vitamin C are essential for detox diet. 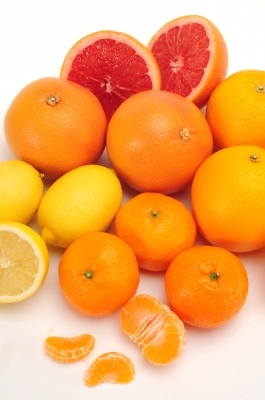 Citrus fruits such as oranges, grapefruits, lemons and limes are highly responsible for detoxifying the body. Other fruits that are part of best detox diet including berries, papaya, kiwi fruits, melons, peaches and red grapes. Cucumber is also a great fruit for detoxification. Cabbage: Cabbage is good for your liver and it helps significantly in detoxification process. Like cabbage- cauliflower and broccoli are also good for cleansing the body. Seeds and Nuts: Nuts & seeds such as almond, walnuts, flaxseeds, pumpkin seeds, chia seeds and sunflower seeds are very good foods for detox. Whole Grain Products: Quinoa, millet, buckwheat and oats are great for detoxifying the body. These foods are rich in antioxidant and dietary fiber and that’s why they provide strong detoxification support to the body. Omega 3 Fatty Acids Oils: Olive oil, flaxseed oil, hemp oil, chia oil and coconut oil are excellent for internal cleansing of the body. These omega 3 fatty acids rich oils are definitely a part of best detoxification foods. Water: Drink plenty of water. Drinking two or more liters of water per day helps to cleanse kidney and liver. A sufficient amount of water is also needed for good digestive system. Water detoxifies your body, boosts your metabolism, clears skin and helps you to lose weight. Always use purified or filtered water. Other Detox Foods: Other foods which are safely part of the best detoxification foods /diet are sea vegetables, legumes, fish like salmon & mackerel, honey, cherries green beans and coconut water. One of the best ways to increase your metabolic activity is to simply use your body. Daily exercise has innumerable benefits including building lean muscle mass which helps you burn more calories at rest. Consider jumping on a mini trampoline for 3-5 minutes a day to give a boost to your health and vitality. Sweating also releases toxins. Above mentioned detoxifying foods are considered best detoxification foods. Add them to your detox diet to get rid of harmful toxins from your body. Also, take time when you eat and chew food well. Existing a Healthy Lifestyle is significant all of which will in the long run prevent intense and serious disorders. This really is tranquil all to easy to gain when you does not need to must get lots of dietary supplements as well as commit hours exercising at a health club. Generally, Cleansing or detoxification means cleaning the blood, the whole body. It does this basically by clearing contaminating impacts. It's like crushing the animate key to your body. I will endorse it to do before any wellbeing organization you are situated to assume control. Total cleanse detox diet is the best firm which inform or provide guidance for cleansing processes like kidney cleanse diet and homemade detox cleanse. It is a momentous approach to manage put yourself general right as to getting more slim and an OK, wash for the individuals who need to keep themselves free of poisonous substances. This is the ideal decision for any individual who needs fiery, results to need getting alive and well is guarded paying minimal regard to his or her time. In the event that you need to take control of your prosperity by getting more thin in a solid way, make a point to attempt the Jillian Michaels Detox and Cleanse. For more information, visit www.totalcleansedetoxdiet.com. Dr Vinod Bharti Raina is Best Sexologist in New Delhi from past 18 years. He has been working from 18 years to educating individuals.